Summary: If you want to upload and import Blu-ray contents to iMovie for editing, you need to convert Blu-ray to iMovie acceptable format like AIC MOV first. Here is how. As an ideal video editing tool, iMovie is widely used by video professionals and haobbyists. However, if you want to import Blu-ray to iMovie for editing, you’ll be disappointed since iMovie (including iMovie 11) only accepts MPEG-2, AVCHD, DV-Standard, HDV (High Definition Video), QuickTime Movie and MEPG-4 formats. Fortunately, there is an easy way to fix this issue. To add Blu-ray movies to iMovie or Final Cut Express, you’ll need to convert Blu-ray files to iMovie acceptable video format like AIC MOV first. To rip Blu-ray to iMovie on Mac (including OS X 10.6, 10.7, 10.8, 10.9, 10.10, 10.11 EI Capitan, macOS 10.12 Sierra), UFUSoft Blu-ray Ripper for Mac will be a great help. With it, you can fast convert DVD movies to iMovie native codec – Apple Intermediate Codec (AIC), which ensures maximum editing quality and efficiency when working with iMovie 11/09/08. Besides, it can also help you rip and convert Blu-ray discs to any popular video formats such as MP4, MOV, AVI, WMV, FLV, MKV etc. High speed and excellent conversion quality let you enjoy your favorite Blu-ray/DVD movies wherever and whenever you want. Now download this program and follow the guide below to complete your task. Note: For Ripping Blu-ray to iMovie on Mac, a Mac compatible BD driver is needed. 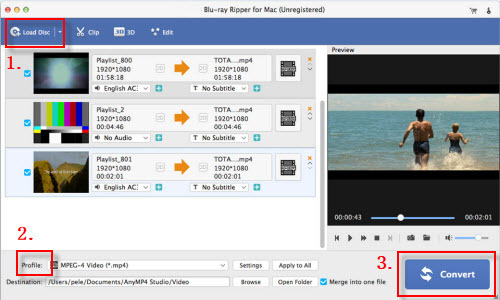 Launch this Blu-ray Ripper and click “disc” button to import Blu-ray movies into the program. DVD discs, ISO and IFO files are also supported. Choose output profile via clicking the Format bar. “iMovie and Final Cut Express > Apple Intermediate Codec(AIC) (*.mov)” is the best compatible video format you need for editing Blu-ray movie in iMovie. Tap “Convert” button on the main interface to start converting Blu-ray to AIC MOV for iMovie. 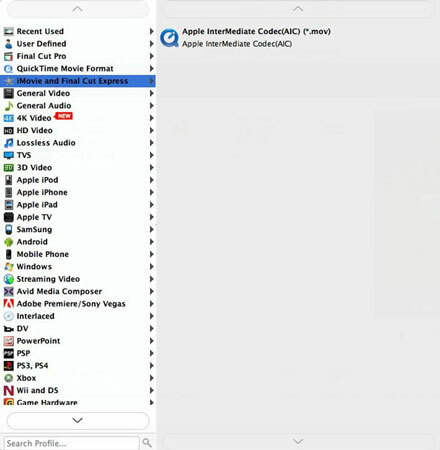 After the conversion, click “Open” to locate the result videos and then launch iMovie,choose File > Import > Movies…, to import the converted Blu-ray movie into iMovie.